Staying fit into the millennium may mean working out less for your money. That’s because after doing an ATM class, your body will move as smoothly as the slide of a debit card. But ATM in this case stands for Awareness Through Movement®, and the classes are part of the Feldenkrais Method, which many say makes exercise as easy and efficient as automatic banking. Brought to this country in the 1970s by its originator, Moshe Feldenkrais, a Ukrainian-born physicist and engineer plagued by a knee injury, the method has long been a professional secret among dancers, actors and musicians. But recently the fitness community has gotten hep to the benefits, and a few on the front lines are serving up Feldenkrais as the latest physical elixir. “We like to stay on the cutting edge,” says Karen Joy, general manager of Fitness for Her! In San Diego, one of the health clubs around the country now offering ATM classes alongside step and sculpt. Basically, Feldenkrais is an educational approach that teaches students to become aware of their bodies and move as seamlessly as possible. For an actor, that can mean getting into character more convincingly; for an Olympian, shaving the winning second off a sprint, for a stroke patient, learning to walk again. Frances Fisher doesn’t need convincing. “Feldenkrais has taken the struggle out of exercise,” says the actress, who used ATM exercises to keep her energy flowing on the set of “Titanic” during long days of filming in a corset. There are two ways to study the method. With Functional Integration®, a practitioner works on you privately, gently guiding your body into improved ways of moving as you sit or lie down, fully clothed. The ATM lessons, which you take in group classes or practice at home with tapes, help you make the same kinds of discoveries on your own through thousands of movements-some so subtle that observing them is like watching paint dry. Both Functional Integration and ATM lessons (many students do only one; others combine the two) are based on the idea that each of us inevitably develops unhealthy movement habits through years of going about life on automatic pilot, overusing the body in repetitive ways and nursing old injuries. Feldenkrais teaches you how to notice these stressful patterns and replace them with more comfortable, efficient ones, so that, as one practitioner put it, you’re not using the force of chewing a steak to eat a cream puff. In a way, the education is like receiving a Thomas Guide to your body that shows you in detail how you normally move and then lets you find alternate routes to avoid an accident down the road. 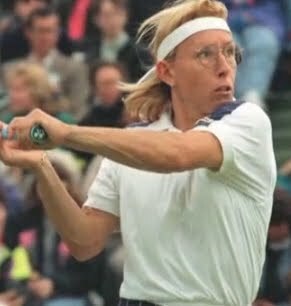 Through Functional Integration, Sugine kinesthetically reminded Navratilova how to look right and breathe at the same time, getting her whole body, including the ankle, in top form again. Advocates of Feldenkrais say such movement education has been the missing link in fitness as we know it-which is why, after 25 years of pounding the pavement, many of us are limping toward burnout. Fisher says this work helped her access an inner, organic sensuality while giving her body a more elongated look. “It’s a great tool for getting into any character,” she adds. And that’s true whether you’re an actress, athlete-or nowhere close to being either. Who wouldn’t want to cash in on that? Copyright, 1998, Los Angeles Times. You are currently browsing entries tagged with Martina Navratilova at Body Equilibrium Blog.